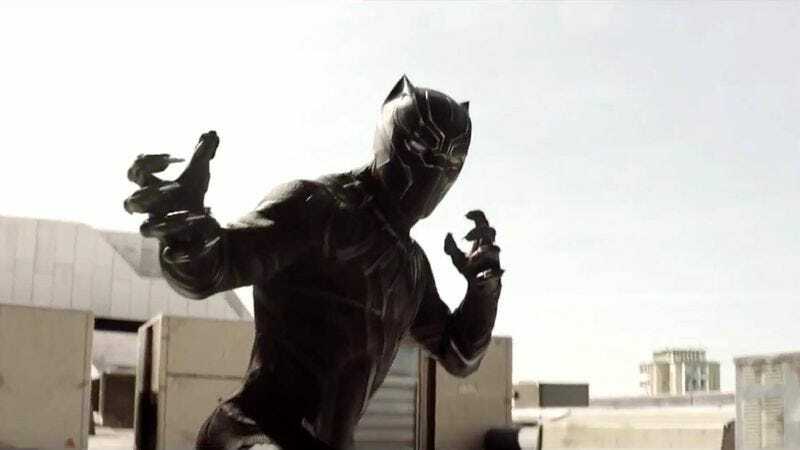 Ever since he first appeared in Captain America: Civil War to confirm that, yes, Black Panther is very cool, we’ve been waiting for the first teaser of Chadwick Boseman’s solo superhero outing. And now, Marvel has announced that tonight, during game four of the NBA Finals between the Warriors and Cavaliers, that first teaser trailer will appear. (How far we’ve come, to think Marvel movies now see the best brand synergy with the audience for the NBA. Our inner 14-year-old is a little pouty about that.) But first, we’ve got the new poster for the film, and man, you do not want to have a staring contest with Black Panther. You will lose. It’s like the designers saw the recent poster for Spider-Man: Homecoming and said, “See that? Let’s do the exact opposite.” No overly busy assemblage of cast photos, no weird need to shoehorn in other locations, and no massively oversized head ruining the spatial geography of everything else? That’s a win for Black Panther. It’s just the character, sitting regally on a throne, and looking like he could break you in half if you so much as sneeze at an inappropriate time. Wait, did we just figure out the plot? Black Panther opens February 16, 2018, with Black Panther 2: Sneeze Ramifications presumably arriving several years later.